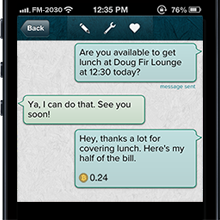 Go to the Conversation View (chat view) with someone you send Gliph messages with and tap on their Gliph in the title bar. In their Gliph view (connection view), scroll down to Push Settings. Turn on Message Content in Push to have future messages from this connection show up in Push Notifications. Turn on Contact’s Tag in Push to have future messages from this connection show the Tag of the connection. Remember you can edit a tag for a connection at the top of the Gliph View by tapping Edit Facets I Share. If you do not see the Push Settings in Gliph view, force close the application and re-open it. Or log out of Gliph and log back in. You will see the options. For now, Android users need to use the Gliph mobile web application at https://gli.ph/m to change the Push Settings. Use the same instructions as above. Once you’ve set it up there, it will work on the native Gliph Android app. We are aware that some of our Android users feel the Gliph Android app is due for an update. we will get a release out as soon as we can. We appreciate your use of Gliph and will continue to support the Android app. For now, we thank you for your patience and use of Gliph. We recognize that some people may not want their conversational partner to enable message content in push notifications. 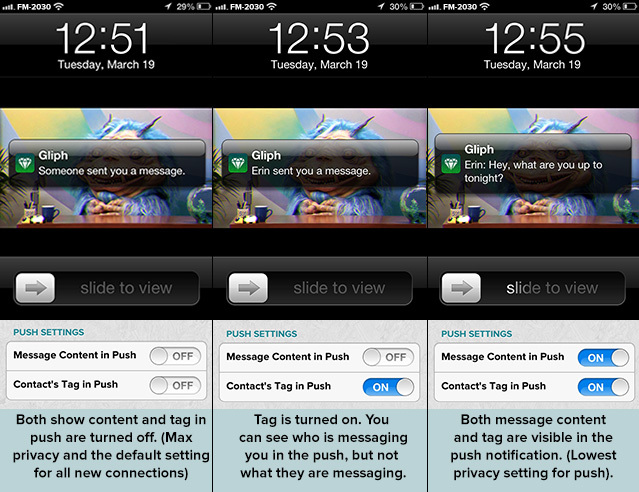 To this end, Gliph now uniquely allows you to view the push notification settings that your partner currently has set. This way, you can have better understanding of the privacy of a conversation you’re having. We also now allow you to see whether your conversational partner has enabled Lockdown™ Privacy Protection. For maximum security of your conversation, both parties should have Lockdown™ Privacy Protection enabled, and you can now see this valuable information at-a-glance on iPhone and mobile web.